It was good to spend a solid three hours with Street Fighter again last night. I was still outclassed most of the time, but then again I caused a rage quit just by choosing my main. Come on, how can you run away from this? Yes, I have used that image before, and I will again. In advance of his final nerfing I have decided to try out Dee Jay again. He is getting quite a few buffs in AE that makes using him a welcome alternative to my middle low tier character who is unfriendly to noobs and was therefore made worse. Again. (You want to see some salty people? 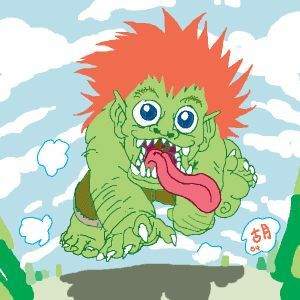 Check out the Blanka boards over at SRK. Even the bug guns like Mullah are not exactly pleased with things.) We don't know when it is coming out, or if it is coming out (HA, like Capcom would pass on more free money) but it would be nice to have a actual sub that wasn't just Blanka minus the green plus some fat and with better normals. I think I understand how to zone with him a little better than I used to, as I was able to keep a Bison at bay who normally stomps me without mercy. I didn't win, but he couldn't just lk - lk - lk scissors me over and over either. I still can't do a lot of his fancy links, but Dee Jay doesn't really need them. Crossup into ducking mk is infuriating, and I will abuse it often. Add to that an invulnerable vertical wake up kick and I might have a chance at some success. And Hat? www.afuckerwhoplaysblankaandtalksaboutgames.com is available, though a bit much to type.